Jamie and my Uncle Keith headed out yesterday at 7am to go fly fishing and did not return until 11pm, now that is dedication. They drove over two hours to a place called Crowsnest Pass, it’s a river southeast of Cochrane where my Aunt and Uncle live. 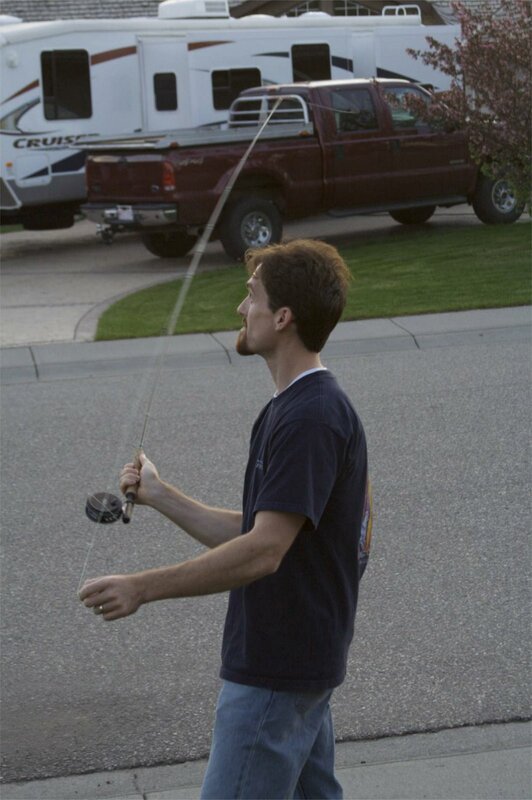 Jamie practiced fly fishing in the yard the last time we were at their house to get the hang of the motion needed to cast, or something like that. I do have pictures of that but I do not have pictures of them when they were out. Much to my disappointment they came back with no pictures of Jamie in his waders, chest high rubber pants, or any pictures of them fishing! I would have been all over that prime picture op. Although I am disappointed without any pictures it is probably for the best since Jamie took a “swim” in the river at one point and got soaking wet; to his defense it is not easy to stand in a very fast current with rubber shoes on wet, slippery rocks. If it was me I would have been swimming more than that, I am sure. Uncle Keith caught three trout, two rainbow trout and a brown trout, and Jamie didn’t get any although he had lots of fun. It was probably a great time spent by all in their “nothing box”. We are off to watch my cousin Amy’s soccer game today and then to hike with my Auntie Trish and Uncle Keith out near Moose Mountain, although we will probably not see any moose there. Either way it should be fun. We are headed home on Monday afternoon but we don’t get back into Orlando until Tuesday; it will be a long over night flight. We are looking forward to our last few nights of relaxation until we get back and have obligations.